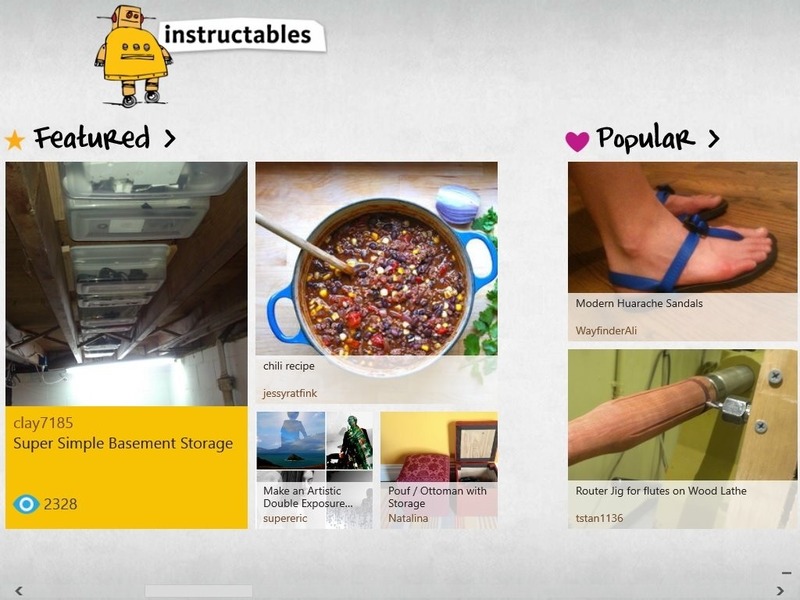 Instructables is a Free Tutorials app for Windows 8. It allows you to read from a number of Free Tutorials on Technology, Living, Inventions, and lot more random stuff. There are over 100k free tutorials available here for you to choose from. So if you are looking for Tutorials on something, it will probably be available here. Tutorials for simple How-tos to Outrageous Experiments, from Simple Recipes to all kind of random stuff are available here. Check out other Creative Idea apps reviewed by us earlier: Creative Ideas app. As you launch this Windows 8 Free Tutorials reading app, the main screen will open up, showing you a number of tutorials. These will be categorized into a number of sections like Featured, Popular, Recent, E-Books, and many others. Just click on the category where you want to read from. That particular category will open up, showing you all the various available Tutorials. 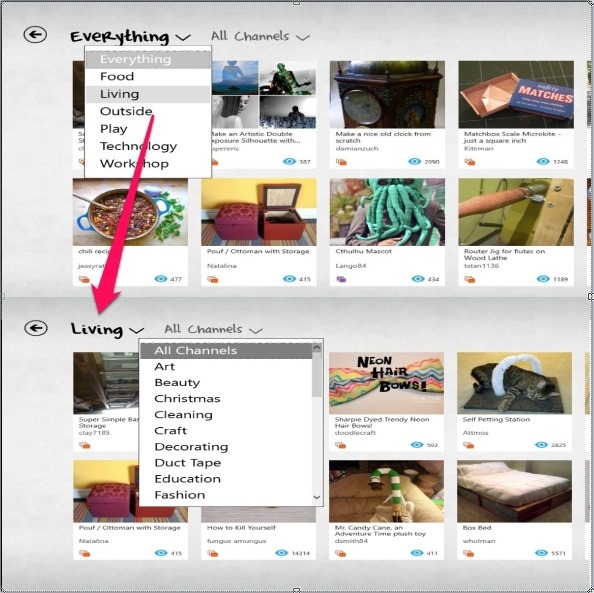 When you choose to open a particular category, then by default, all the available Tutorials will appear in front. Then you can filter your results more effectively by choosing a different options from the dropdown in which everything is selected by default. Choose from the available options like Food, Living, Technology, Workshop and many others. Now, you can either browse and read a particular Tutorial or can filter the results further by choosing among the various channels available in the Dropdowns to filter your results more effectively. You can even search for Free Tutorials on a particular topic. Just search using a particular keyword or phrase and it will show you all the related Tutorials in this Windows 8 Free Tutorials reading app. 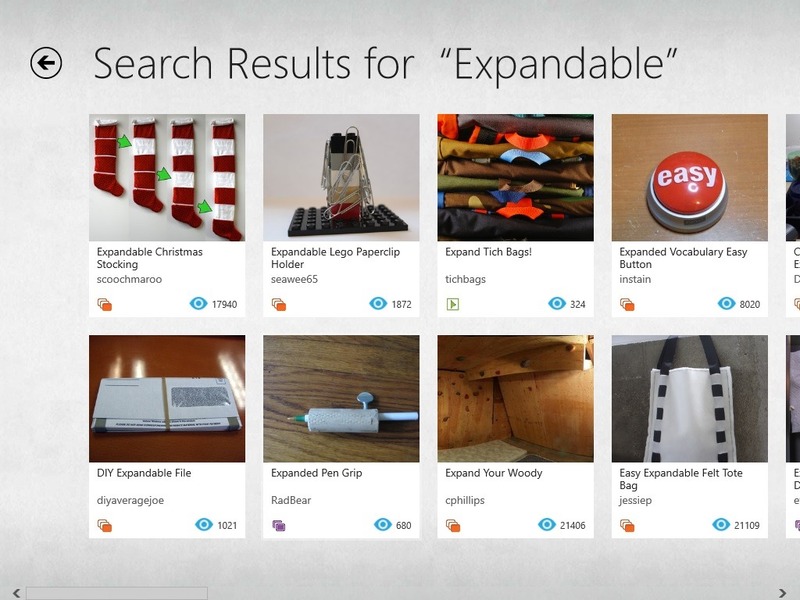 Now, what is just incredible about Instructables is that you can search for anything. Whatever the thing be, surely you would get tutorials on that on this app. Whenever you view any Tutorial on this Free Tutorials app for Windows 8, you will be directed to the tutorial page. Now what is really amazing about the Tutorials here is that they are given in very simple language which will be very easy for any users to follow. Tutorial opens up on a single page for the user to connect better with it. Step by Step follow up is given so that the user can easily understand what they should follow whenever such a need arise. Video Tutorials are also included which will help you to understand Tutorials better wherever such a need arises. Also check out 3 free drink recipe apps for Windows 8. Nice user interface: The user-interface is quite nice with all the tutorials available right at the main screen. Vast Database: The Database of Instructables is very large. There are more than 100k Tutorials available here to read. Tiled appearance: The tutorials appear in tiled form on the main screen. You can easily understand what the tutorial is about from Tiled appearance as it gives some idea about the tutorial. Smooth transition: Transition is very smooth when you will Browse for any topic. Filter your preferences: You can filter your preferences for optimized results. Entire Tutorial on the same page: Once you have chosen a particular Tutorial to read, the entire Tutorial will open up on the same page. Swipe easily and read through the articles easily for your touch-enabled devices. To conclude, I would like to say that this free tutorials app is quite good. I used it myself and was able to get tutorials matching all my searches. The interface is quite good and I was able to figure out my way through the app right on my first try. The Database of the Instructables is quite large and tutorial related to almost everything can be found here very easily. Searching is quite easy, with you having more capability to filter your results in a better way. All in all, I would highly recommend using it. Get Instructables for Windows 8 from here.